Last weekend barely a single British media outlet failed to mention the Russian Black Sea resort of Sochi as if the winter Olympics were still taking place. Nikolai Gorshkov follows the running commentary. The venue on everybody’s mind was indeed the Olympic Park in Sochi but the occasion was the Formula 1 Grand Prix, the first such event in Russia in a hundred years. The qualifiers and the race were aired live around the world by over a dozen national and international broadcasters and every newspaper sports page covered the story. But unlike the coverage of similar events in well-established locations, this time it was more about politics and the Russian President than pole positions and pit stops. “Ideally we should be talking about Lewis Hamilton versus Nico Rosberg in the title fight, but [Marussia team pilot] Bianchi’s plight [fighting for his life after the race track crash injury at Suzuka] and the political nature of the race make that impossible to do as freely as we would wish”, lamented Mail Online. Somehow, a newspaper from Lewis Hamilton’s home turf, Welwyn Hatfield News 24, didn’t find it difficult at all to give its readers an objective of the Sochi circuit, the performance of the drivers and enthusiasm of the crowd. But the bigger press guns couldn’t keep their ink-stained fingers off politics. “This weekend's race has been orchestrated to boost President Vladimir Putin's prestige at home and abroad”, said The Telegraph. It must have taken an age to orchestrate this, since the first attempt to stage Formula 1 in Russia was made by its boss Bernie Ecclestone back in 1982, when Vladimir Putin was a mid-ranking KGB officer in Leningrad. Actually, it was in this very city, under its original name of St Petersburg, that the first Russian Grand Prix took place a hundred years ago. In 1914 just two months before the outbreak of the Great War it was won by Germany's Willy Scholl driving a Mercedes Benz. Fitting then, that the German carmaker could celebrate a century of involvement with the Russian Grand Prix by winning the Sochi race last weekend! Yet, a Guardian Sports Picture of the Day made it look like a “dark day” even though the sun was shining in Sochi. Was it because as Mail Online thought, “Vladimir Putin's security forces could black out British TV images at Russian Grand Prix?” Well, probably the Russians didn’t want to upset the folks at Silverstone too much. 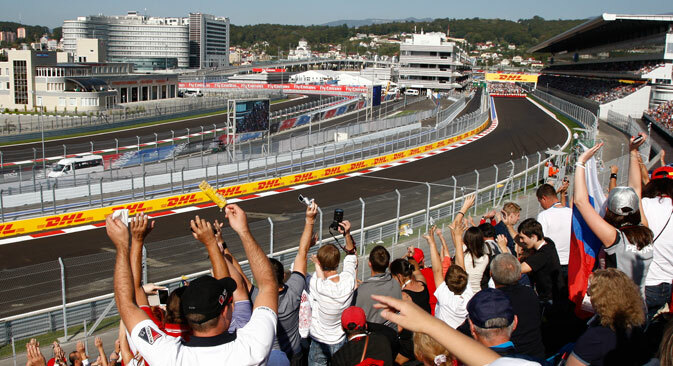 The Sochi circuit was given the thumbs up by the F1 drivers and engineers. Designed by acclaimed architect Hermann Tilke, the challenging 18-bend layout is the third longest track in the 2014 calendar, and faster than Monaco, Montreal and Singapore, as the Welwyn Hatfield News 24 reminded its readers. However, quite a few backseat drivers writing for the sports pages were looking for potholes on the smoothest of tracks. The Telegraph claimed it had cost an astonishing £30 billion, somehow omitting that this was the total cost of Sochi’s regeneration in the run-up to the winter Olympics. The Telegraph goes on to compare the Sochi Autodromto a “Potemkin village”, resurrecting a hoary old story about makeshift villages apparently put up by a local governor to please the Russian Empress Catherine the Great when she inspected the newly acquired territories of Novorossiya back in 1787. “The tale goes that Potemkin’s men would assemble mobile villages, dressing up as peasants, before moving the settlement down the Dnieper River overnight for inspection by Catherine the next day”, the Telegraph said. “The notion of a 'Potemkin village’, a facade concocted to hide an undesirable reality, was born”. Such is the staying power of this idea that an Irish Times reporter at the G8 summit at Lough Erne near Enniskillen in 2013 used it to describe the dressing up of some deserted local shops with large stickers placed on the windows to give the impression from a distance of thriving businesses. It’s been long established that Count Potemkin had no need to fool his Empress and lover. Several contemporaries independently testified to the astounding pace and scale of changes in hitherto “desert lands” neglected by the previous rulers, the Ottomans. The story seems to have been spread by a diplomat from Saxony who was not even with the Russian Empress on her journey through New Russia but picked up gossip and hearsay back in St Petersburg where Count Potemkin had powerful rivals. When he published the rumours at the height of the standoff between Britain and Napoleon in the early 1800s, the British press in support of its cynical view of the Russian “bear" seized upon it as a godsend. But even before its publication, commenting on the Western reaction to the Russian acquisition of Crimea in 1783 Catherine wrote to Potemkin “Europe’s envy is of no concern to me. Let them chatter while we do business”. Was something along these lines on President Putin’s mind when he was watching the Sochi race in the company of two kings: of Formula 1 and Bahrain?